Granita, originating in Sicily, is found all over Italy. It's a cinch to make and really, there isn't a wrong way to make it! 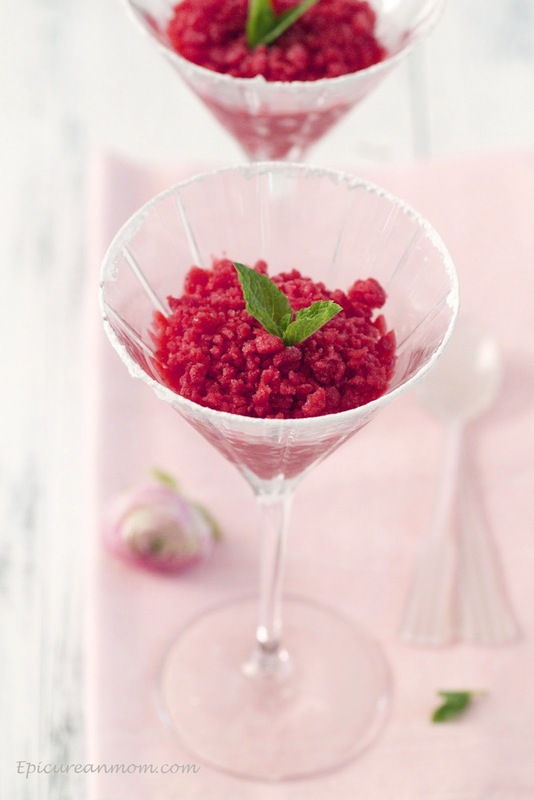 In Italy, you will find a crystallized granita in the west to a smooth almost, sorbet-like, granita in the east. It seems to differ between each city. I really enjoy both textures, although I made this recipe a little smoother. The key to granita is a little patience and a lot of scraping. As the raspberry mixture is chilling, scrape the outer edges of the pan every 45 minutes. No ice cream maker needed! This is a wonderful recipe to make with your little ones. Ky (5) loved watching the crystals form and helping me scrape them up. Once it was finally finished (which took A LOT of patience for the girls, who wanted to eat it each time it was taken out of the freezer) they quickly devoured this fun treat and promptly demanded more. I'm thinking a refreshing green tea or lavender water granita is soon to come! In a small saucepan over medium heat, combine water and sugar. Bring to a boil, stirring until sugar is dissolved. Take off heat and let cool in the fridge for 30-45 minutes, or until cool to the touch. Blend raspberries in a blender, until smooth. Run raspberry puree through a sieve into a medium bowl; or skip this step if you prefer the seeds. Add the cooled sugared water and lemon juice, stir well. Pour raspberry mixture into a shallow pan and place in the freezer for 1 hour. Remove and scrape the crystallized raspberry puree from the sides of the pan. Return to the freezer. Repeat this process every 30-45 minutes, until completely frozen, about 4 hours. Fluff flakes with a fork, and serve immediately or store in an airtight freezable container and fluff before serving. Such a pretty dessert, Katie! I love granita, what a perfect way to usher in spring and summer. Great flavors, too. So gorgeous, Katie! How stunning Katie! This is such a refreshing and light way to enjoy a cold treat on a hot day! So beautiful! I like your blog very much! Your pictures are amazing and so beautiful! No doubt that this will taste delicious as well! That is so sweet KitchenSisters! Thank you so much! I want this served to me for Mom's Day! this looks so beautiful and delicious! This looks so delicious and refreshing. Amazing photography. So beautiful Katie!!! It's a bit cold here for grantia's now, but I'd love one of these in the middle of summer. You will love it Jennifer! I love raspberry granita! Lovely photos, Katie. Thanks for reminding me about a summertime favorite in this house. You make the prettiest food. It's almost to pretty to eat. Gorgeous, vibrant color. 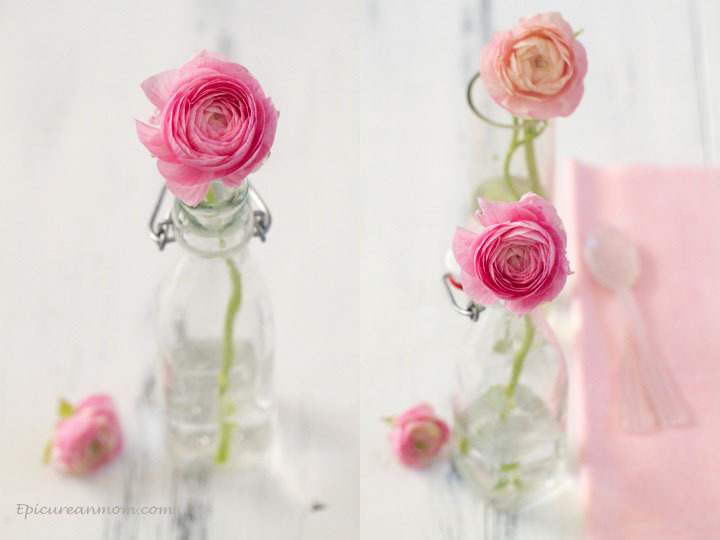 What a beautiful post with stunning photos and styling! I haven't tried raspberry granita. Sounds refreshing for warm days like today! With the temperature getting higher and higher we'll soon turn to frozen treats to calm our sweet tooth and cool down a bit. Ahhh, perfect for hot days! And those flowers are just absolutely delightful! I love, love, love pretty flowers! Are they ranunculus? 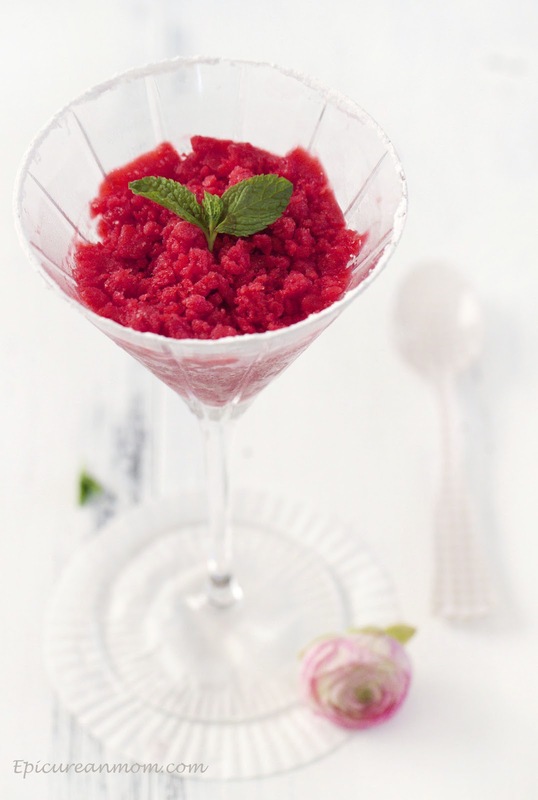 Hi, I’m Sonia, an Italian food blogger, sorry for my bad English, I want tell you that I have included the link of this recipe in the section on my blog dedicated to “10 ways to make” (“10 Modi di Fare”) granita recipes. The post is ‘Granita ai mirtilli’ I hope not to bother you. This looks so delicious! A love the step by step photos. Thanks for posting this great recipe!